By tearing out old carpeting, giving the walls and floors a new coat of white and adding midcentury modern pieces, this set of art collectors curated a residence to which they can easily invite guests to get a last-minute weekend. Mark has been collecting art for a decade, and Patti, even more. The floor is red brick coated in epoxy. The few browses art galleries, antique shops and flea markets in Los Angeles, Palm Springs, San Diego and Orange County such as decor. “Everything besides the white couches is used furniture,” says Patti. Though it’s the most appropriate room in the house, the living area feels inviting and relaxed. Floor-to-ceiling windows are the best original characteristic of the house, allowing light in on two sides of the room. Jonathan Adler vases along with a purple ceramic vase by Adam Silverman (Heath Ceramics) sit beneath art by Mario Wagner. External, a totem by Stan Bitters could one day be turned into a fountain. 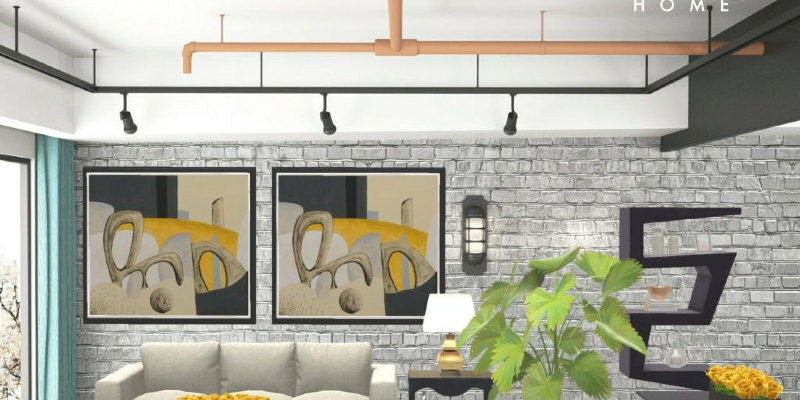 Art-filled hallways enliven the whole house. Windows, skylights and mirrors extend the visual distance. This hallway is the perfect example. On the rear, original mirrored doors hide the main closet. On the right, tripanel sliding doors, which give a maneuverable opening to the sitting room/third bedroom, have been suspended without floor monitors. Underfoot, white laminate floors transitions to concrete from the master bedroom. Dana: What are your favorite art pieces? Mark: Among my favorites is the Mario Wagner piece from the dining area. This one has a fairly cool story. It was a surprise birthday gift from Patti four or three years back. We saw it at a gallery in L.A., which was the very first time I’d seen his job. The gallerist delivered it in person and took me by surprise, and we all ended up becoming very good friends. I like the collage and the 1960s sense of it. Although the master bedroom features concrete floors, warm features soften the space. A floor-to-ceiling window sits directly on the right of your bed. A set of vintage black chairs flank a Milo Baughman burled wood vanity table in the San Diego consignment store. A closet in the adjacent hallway offers lots of additional room for art. Dana: Where are your favourite places to shop? Mark: Consignment Shops in Palm Springs, L.A. and San Diego; Fat Chance, Skank World, Xcape, 10 Ten Design. Dana: What is your personal style and decorating doctrine? Mark: Our design is midcentury modern, however, it must match the house. Whatever you put in there, you are gonna have to live with it. Additionally, odd amounts. Everything works better in strange numbers. I really don’t know why, but it does. The master bathroom presented the largest renovation challenge. To install a new tub, the toilet had to be shifted and the concrete floor snapped up and repoured. A massive tile wall provides the bathtub’s backsplash. Black tile grout, rather than the more customary white, intensifies the guest toilet’s visual mosaic. Since the windows are practical and part of the original modern character of the house, the few left them untouched. Whimsical bits fill the sitting area: a vintage petal table by George Nelson plus a sofa bed upholstered in glistening boat vinyl. “We couldn’t find anything else we enjoyed,” says Mark. The kitchen, which includes original cabinetry, new appliances and Caesarstone countertops, is a striking blend of new and old. The aubergine tiles on the backsplash, in bowtie and diamond contours, are from the Heath Ceramics seconds outlet in Sausalito, California. Dana: Other than the purple Knoll chairs, what’s your preferred find? Mark: The tiles beneath the pub are just one of my favourite features. When we found them at the Heath Ceramics minutes outlet in Sausalito, we took them without knowing what kind of layout we’d do. Patti: He laid them out at the garage first. Mark: The bowtie and diamond contours — I love the way they go together, so that I just started playing around. Patti: We did the pub first, then we’d additional for the counter tops. The tranquil outdoor space offers ample solitude and superbly showcases the couple’s ceramic pots and vintage patio furniture. Dana: What is your next home project? Patti: There are still some things I would like to do with all the garden. And I would like to wallpaper the guest bedroom.